The 2010 Topps set is filled with enough Jackie Robinson cards to make any Dodger fan happy. I've collected several pics of as many as I can find. Below is the short printed base card of the Hall of Famer. This is probably his scarcest card in the set. Here is a Legendary Lineage insert card featuring Jackie Robinson and Matt Kemp. Below is another insert card, available only in Target wax boxes, of Jackie that uses the vintage 1951 Topps Red Back design. Here is a "History of the Game" card celebrating his first game in the Major Leagues. 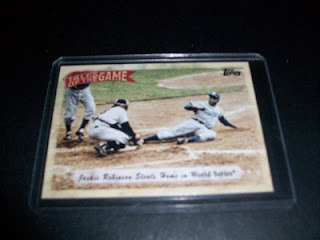 Below is a "Tales of the Game" card showing Jackie stealing home in the World Series. Here is Jackie's "Peak Performance" card. Below is an insert card of a series called "Cards Your Mom Threw Out" featuring a reprint of Jackie's 1953 Topps card. I would cry if Mom threw this card away.